So I'm interning at a games company at the moment, and the art is pixel art. So for a few weeks I've been practising, reading up on tutorials and all that jazz, and so I decided to try and put my skills so far to use. http://stickgag.deviantart.com/ Is my deviant art site. One of the pieces I put up there is "Nameless... for now." Mostly because I never named it. Reason I gave ya my link isn't for advertising. 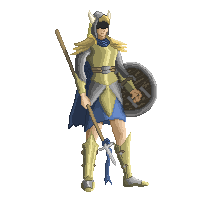 it's because I did a pixel version of nameless. If you can't see it, it's also on the site there. Just right click the pic to view ti by itself. I think it's 200x200. I edited some things from the hand drawn version as you may see or read on the site. I need critique as it will helpe me improve at my job! Your composition needs work. The character looks like he's/she's tipping backward. The shading on the legs looks too cylindrical. If the wind it blowing the cape, why is the hair stiff and why is the ribbon on the spear motionless? The color is desaturated and needs more contrast. What's the style you're going for? Realistic? While faded colors do contribute to a more realistic look, that isn't all there is to it. Looking at the original, non-pixelled version, the stronger values are of much better choice. Underneath all those garments, the piece does not seem to have much foundation. This leads to the look of a paper-cut out in which the limbs are flat and cylindrical, and the pose is stiff. More knowledge of basic construction may be needed. When making a serious character design, using reference is generally advised. Not necessarily strictly from reality, however. For example, a viking's costume or knight's armor from a video game might be more exaggerated and suited to your needs, or a well-designed creature that doesn't exist in reality would be a good point of reference for the same reason. Still, it's not to say I don't recommend using real things for reference, of course. If it helps I could make an edit. I'm glad you guys replied and took this very seriously! I gotta admit I was pretty shocked by this critique, never had this much thrown at me all at once. But I did ask for all of this. When I come back to work on Tuesday, I'll definitely make some changes. I do have to agree the shading looks too cylindrical. The fact the hair and the ribbon doesn't blow with the cape doesn't make sense now that I think about it, and I'm starting to see how 'fake' the character seems so to speak. Not sure how I can make it look less 'paper' like. I am a newbie at this sort of thing, so my shading rather poor. 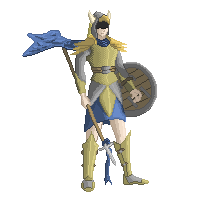 If you take a closer look, I tried to use some dithering on the chest plate, but then I gave up with dithering and just did boring old shading on everything else. Thanks for the advice, I'll do some work on it as soon as I can! To have a peek at some materials irl and go from there. Point 1. shows that the overall sprite is leaning a little back, that doesn't quite ensure the idle state he's supposed to be in so I rotated the overall statue accordingly so it has a stable stance! As you can see, the legs were a little too long (can tell by looking at the original sprite aswell), otherwise, the fundamental skeleton you have, is quite nice! Just little changes here and there like misplacement of thorso and so on. At 2., I placed the original sprite, to show the differences between all the changes! And yeah, there isn't much more to it... what I did at 3a, is overpaint on the skeleton modeling the final character with the specific colors it should have, starting with a base color and later on defining the shadows...that's what we do, we work with light and darkness to define shape! That is why your sprite looked so paper-like, as you said it. Also did I change the scarf, the wind compared to the spears little clothing, was contradicting, so I chose the non-windy version, because it would just enhance the idle stance itself. Last but not least, what I used to create this, was simply my Tablet and Photoshop... the latter is not really required to create an output better than the actual shrinked concept. Last advice I give, have the guts for brutal change, try abstract colorcombinations and create depth! I just want to say thank you to all of your advice! You have a very good point Elk, and your right. I usually don't start with a reference as I allow my imagination to provide. I tend to draw legs a bit too long, proportion has never really been my cup of tea. From what I've been reading, I should definitely be studying some irl stuff for reference if I'm to really get into pixel art. My shading definitely needs work as well. I've learned in pixel art that highlighting can be just as important as shadowing, so I'll immediately start working on that. You guys were right about the scarf... not sure why I made it blow in the wind whilst everythign else is still. Guess it's a habit of mine when I do cloak/cape/scarf stuff like this. Just letting you guys know I am using Photoshop and a tablet. Lastly I'd just liek to ask if theres any tutorials or tips you guys can provide. I have been reading on a fairly large list of different tutorials for isometrics, shading, dithering, just pixel art in general, but if you guys know of any sites/tutorials that helped you start or just generally really good for beginners like myself, that'd be awesome! btw great concept art, has way more character than mine. I'm not going to limit my stuff too much just because I'm going to pixel art it. I roughly redid it trying to follow everyone's advice. Because it's 'roughly' done, it isn't TRUE pixel art, now is it? I will actually put effort into it when I know I'm on the right track. Heres the original for comparison. I changed the cape. Removed the dithering. Tried to make the values stronger, but adding more highlights and shading. Changed the length of the leg. That is unfortunately all I was able to do, and I still feel something is off there. I just wish I wasn't so blind to these kind of things. Just let me know if I've either fixed my mistakes, or produced more. Thanks in advance! PS The highlight on the chestplate is too big. I know. But anything else? It will always be pixelart, right from the start, as long as you use no brushes and filters and whatever effects there might be... if you do it with the pencil dool with whatever size it might be and a solid color, it is pixelart ! When I looked at that post, at first i figured... screw it he pretty much made it 200% better. But then all that work would have been for nothing, espiecially your work. Plus I always wanted to be a game designer, and at some point be able to draw out my ideas, and have someone twice as better as I am draw it out conceptually and make it look way nicer. It was a good boost of motivation!